As I mentioned in Sunday's post, I've joined with a group of authors and bloggers for a Win with eBooks Event. It is great for you, my readers, because you can enter to win a Kindle Fire or $200 Amazon Gift Card (you can enter either on my Sunday post or at the Win with eBooks website). Also, you can meet new to you authors and pick up their books for 99 cents. Today, I have the pleasure of introducing you to Karen Pokras Toz, author of Nate Rocks the World. Watch the trailer for her book and then read what a day in her life is like. Welcome Karen! The smell of hot coffee wafts through my bedroom. I slowly open my eyes to see him standing next to the bed – tray in hand. What? Your day doesn’t go like this? Oh wait – mine doesn’t either! My mornings usually involve child and pet wrangling. I used to try to get up an hour before everyone else to get some writing in, but now that my youngest is in Kindergarten, I’ve been able to move my writing schedule to later in the day. intended to be an author, but somewhere along the way, I decided the other two were necessary, like it or not. And so, for the next seven hours or so – I spend my time answering emails, tweeting, catching up on blog work, tweaking my website, making new contacts, advertising my book, taking care of the business end, and oh yeah – writing. There are days when I just have to stop everything else and remind myself that first and foremost – I need to write. After all, writing is what got me here in the first place. When I first realized I would have seven hours to myself every day, I thought: Wow! I am going to get so much done! I’ll write books, I’ll get caught up on laundry, I’ll make fancy dinners every night – it’ll be great! The truth is (much to the dismay of my family) very little of that gets done. In the three months since I started my new schedule, I’ve woefully neglected the laundry and served my family the same old standby meals they’ve been eating for years. Somehow – this little writing thing, turned out to be a lot of work - - - and I love every minute of it! So while there are no expensive lunches or spa appointments in my daily life, I wouldn’t trade what I do for anything. Dream big and rock on! Karen Pokras Toz is a writer, wife and mom. Karen grew up in Orange, Connecticut and currently lives outside of Philadelphia with her husband and three children. 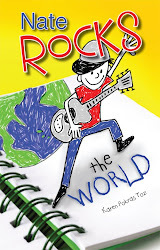 In June 2011, Karen published her first middle grade children’s novel for 7-12 year olds called Nate Rocks the World. She is currently working on the second book in the Nate Rocks series, Nate Rocks the Boat, to be published in 2012. Karen is a member of the Society of Children’s Book Writers & Illustrators (SCBWI), Association of Independent Authors (AIA), and the Independent Author Network (IAN).